Great intro to Venice. Romi our guide was a local and really knowledgeable. The morning was spent walking around Venice and learning about its history. 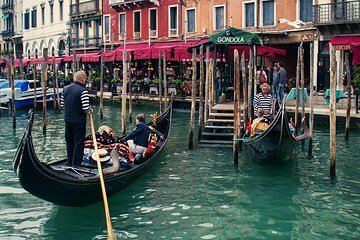 The Gondola ride was enjoyable, don’t expect it to be romantic as they fit 6 of you in per Gondola and there’s no chance for a photograph together if you are the last ones in the boat as you are not sat together. That said it would cost a lot more to go on your own and it was a great way to see Venice from the water. It was good having a local guide as she was able to point out lots of nice and reasonably priced eating places. The afternoon was spent with a tour of St Marks Basilica and the Dogges Palace which was really interesting. When the tour was over you could use your ticket to access the Museum which was well worth a visit. A very enjoyable day and a great intro to Venice, we would certainly recommend it. After a late night the night before, we were a little concerned about having to meet before 9:00 AM. 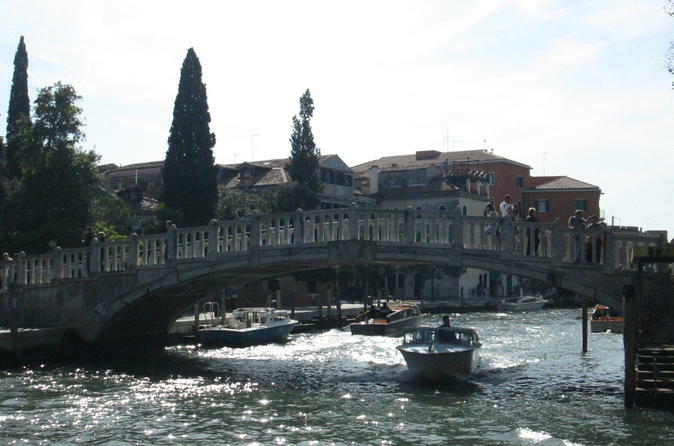 We needn't have worried, as the meeting place was only a 10-15 minute walk from our hotel (Venice is not as big as it appears on a guidemap). We loved that this tour showed us all the major highlights of Venice, but we never took the most direct route to anything so we saw a lot more than we had expected. Our tour guide, Moisè, injected a lot of humor and social observation into his commentary; with interesting nuggets of history, art and architecture. It was a very personable and friendly tour. This is an all-day event, but we all had a good amount of time for a lunch break and Moisè gave us all tips on how to select a non-tourist-trap lunch spot - AFTER our gondola ride. From the Fish Market (yes, you read that right) to Marco Polo's "house" to the San Marco clock tower in the morning; and the Basilica San Marco, the Doge's Palace and the Prison "Palace" in the afternoon; we learned so much about Venice's history, its famous inhabitants and its beautiful art and architecture. Highly recommended! Sabrina was our guide and she was wonderful. My daughter and I were both impressed with her knowledge and the sights we visited. We fell in love with Venice! She told us all about the history of the city and each place we visited. The Basilica is beautiful! I really wasn't all that interested in he Doge's Palace, it was more my daughter's thing, but I learned so much - it was a very interesting place. This tour changed my mind! The gondola ride was fun. I was a bit of a wimp with how tipsy it seemed to me, but our gondolier was a very nice man and we had a great ride around the canals with him at the helm. I hope to be able to go again. Grazie, Sabrina! This was an exceptional tour. Our guide Maria had the six of us riveted with her enthusiasm, her deep knowledge of her beautiful city and her wonderful stories. She was happy to answer any and all questions The gondola ride was fun, there was time for a leisurely lunch but I for one, would have walked and listened to her for as long as she wanted to talk about Venice and its past present and future. Our tour guide Pam was wonderful and so knowledgeable. The Dodges Palace was my favorite part and seeing the prison cells and the stories! We met a great group from California and they were a kick! I wanted to give 5 stars except for the gondola ride. Our gondola operator screamed at us for taking his picture. He told us âhe was not our clown and we needed permission to take his picture.â What? Youâre a gondola driver in one of he most tourist places on earth! Of course we wanted a picture of the gondola experience. As we departed he called us stupid Americans and I thought to myself....without tourists your job doesnât exist. Our group wanted to tip him before our ride and we even discussed how much. This guy was a real jerk and realized he despised his job and us. My recommendation would be to screen the gondola operators beforehand otherwise skip it all together and do the tour only! This tour has two parts. I needed to use the laboratory after the first part. And because of the crowd and lines I was 5 mines late to join the second half. I was stunned that they left without me, as I tackled my way back to the meeting point, and even went to the places- the Academia and Duomo, to see if the guide at least left my ticket there. She didnt. I didnt get to see what I paid for. Extremely unprofessional and I feel robbed.